Technology, continuous improvement, and creative design has taken our custom shirts in a new direction. Of course, for classic professional dressing we continue to offer classic custom dress shirts in the finest cotton pinpoints, twills, broadcloths, jacquard, and pique fabrics. However, now we can build your corporate casual and weekend wardrobe too. Picturted below is just one example from our vast collection of innovative designs. 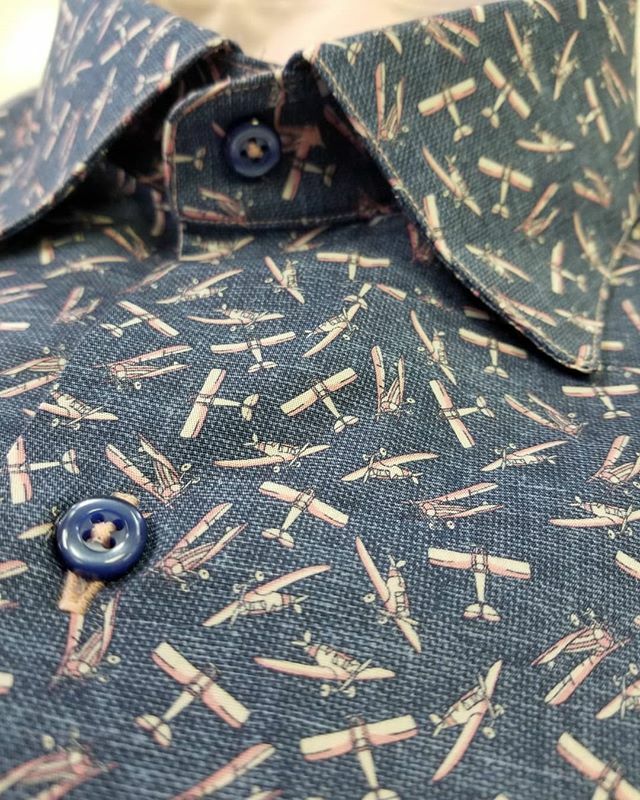 Check out our “Airplane Print” 100’s 2 ply cotton blue ground shirt with pink accents and pink trim inside the collar and cuffs. You select the pattern, trims, buttons, and even the color stitch for the button stitching and monogram. Or leave all the design work up to us. You’ll get custom shirts designed “just for you” with a custom fit too. Our clients are having a lot of fun designing and wearing these incredible custom shirts. These “are not your father’s custom shirts”. Just call our wardrobe hotline or email to get your new casual custom shirts started.